Again it is my annual tradition to celebrate the birthday of my favourite actor, Jim Garner. 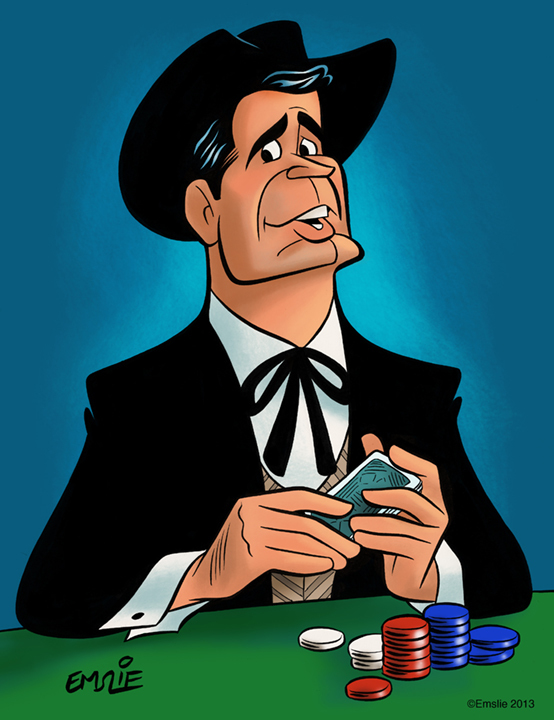 For this year's celebratory caricature I've decided to portray Jim in the role that first brought him a large degree of international fame, as gambler, Bret Maverick in the TV series Maverick, which ran from 1957 to 1962. I was too young to know the show when it was originally broadcast and, sorry to say, I don't recall it ever having been made available in the years since in any of the markets where I lived. As such, I must confess that the only episodes I'd ever seen were the handful that were release on a single DVD back a number of years ago. Happily that situation has now been rectified, as the complete first season of Maverick was released on DVD this past year, with season two due out very shortly. The character of Bret Maverick is a professional gambler and sometime conman, though only conning those whom he believes are deserving of being brought down a peg or two. He is always a champion of the underdog, and will go out of his way to see that an innocent person receives justice. Though a fast draw and crack shot with a pistol, Bret often manages to get himself out of most tight spots on his wits alone. As a gambler, he has learned to read a man pretty well, anticipating correctly what he's likely to do and being able to cleverly bluff his way through a situation as if he were dealing with an inferior poker player. I love the quirkiness of the series, where no character seems to follow the conventions of the traditional TV western. Even some of the baddies may adhere to some code of honour. Ironically, though I had never seen the original Maverick, it was when Jim reprised the character 20 years later on Bret Maverick that I first became aware of who the character was. It was also on the set of that TV show that I was able to realize my longtime dream of meeting Jim Garner. You can read about that visit to the set on this previous post. Jim Garner is in his 80s now, and pretty much retired from acting, but I hope he knows how many people he's brought great enjoyment to through his numerous film and TV roles. His legion of longtime fans are extremely loyal and still watch him onscreen every chance we get. Incidentally, a special thanks to Robert Howe, who was fortunate enough to have worked on The Rockford Files back in the mid-70s for a couple years, and who has recently written a new book reminiscing on that time, as well as having created an official Facebook fan page dedicated to Jim. If you're a fan too, please check these out! Happy Birthday, Jim - we love ya'!